What rings are you talking about, Taffy? The rings I'm referring to are the inner rings of the roller bearing, with the shroud/edge that take a small axial load. Both times I have tried to use roller bearings, that edge has been damaged and pieces have gave large secondary damages. I have installed them with appr. 0,8mm axial play. Yeah I know! No Nobel prize for me! What a scandal for the committee! I mean, the prize for having made the most mistakes, on one single engine type, should have been mine years ago! I choose Husaberg because of it being very light weight with high level of tuning from the start. And, Yes, patriotism naturally played a part! i mean, the original design was made by Mr Lars Nilsson at FOLAN, which was 12km from where I live. Lot's of skilled people withing motor design, tuning and manufacturing are clustered within a 40km radius, so that network is very valuable to me. Did I mention my machinists brother in law designs components for Koenigsegg, and my machinist manufactures them! Koenigseggs engine mechanic is doing my dynoing. My old neighbour used to be responsible for production line at Koenigsegg. I have welded som alu pipe work for the AC plumbing in a Koenigsegg, so I'm "surrounded"! the new collar goes where #77 is currently and the seal #77 is replaced by another seal with a larger ID. Ok! The curve ball was expressing that the ring was "thrown away". I figured that there is nothing in an OEM engine to throw away! I will put my engine together today with ball bearings, because then I now the replacement interval (5-6 hours). Any other bearing set up may have a longer or shorter replacement interval, but it is unknown at the moment. Since the consequences of a bearing break down are tough (lost race and maybe expensive secondary damages), this is not the time to experiment. I rather tear the engine apart after each race (1,5-2h), than exposing myself to the risk of a bearing break down. After season (late September) I will consider making a new crank. It will be without CB with a thicker left cheek. The right side cheek will have two bearings. The extra one will be positioned in the flywheel compartment, mounted in a cage that replaces the flywheel cover. I'm not using the flywheel anyway so... Thats the easier way for my to make the mains last a little longer, but it doesn't make the big end any better. Then we are talking solid crank, billet cases, larger diameter primary gear and a split rod. Last edited by bushmechanic; May 23rd, 2015 at 01:23 AM. F1 gearboxes run gears as thin as 5mm up to 12mm for the higher loaded low ratios, just need good materials. A lot lighter and compact that way. Mats, are you using a ring on the crank to pull the crank to the left? you know, the ring is in the left cover and the nut tightens the gear onto the ring which is butted against the main bearing? this is the oil seal, with a 38mm ID and not the usual 30mm. if your crank flexes, the ball, able to run 'free' in the middle of the trench, able to wollow and weave has it's best chance with this set up. Last edited by Taffy; May 22nd, 2015 at 11:48 PM. 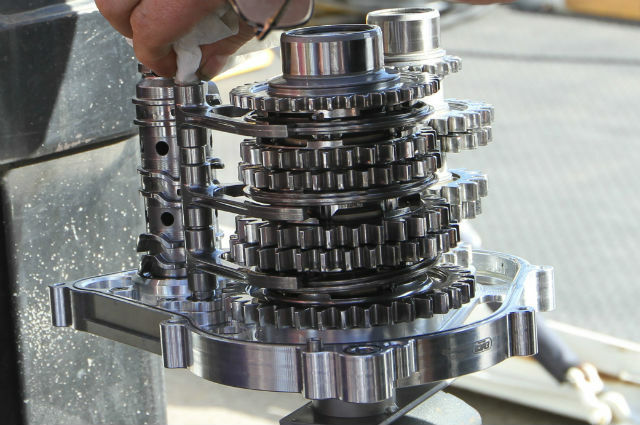 Thumpers work with an uneven speed of rotation of the crank. This is very different from multi-cylinder engines, where there are far more acceleration pulses (from the combustion stroke) along 2 revolutions of the crank. This rough pulsation easily breaks the oil film between the teeth in the engaged pair of gears. If the oil film breaks, there is a great risk of pitting damages. Because of this, a thumper calls for much wider (and/or larger dia) gears than a multi-cylinder engine. It's all about the surface pressure in the thin contact line! case hardened steel found in the Husaberg box. Ah! You are talking about Unobtainium! It is obtainable but unaffordable.